Happy New Year! Yeah I know, I’m two-plus weeks late. Sorry, but between signing off on the final approval of the Speed On The Water 2018 Year In Review magazine PDF files on Monday and turning in the pre-sale distribution list to the printer in Bloomington, Minn., this morning, I feel like I’ve been so focused on 2018 information and photos over the past couple of weeks that I just started wrapping my head around the fact that it’s 2019. With that comes scheduling, budgeting and so forth—and with my partner in speedonthewater.com, Matt Trulio, that process already has begun. It’s on to another year with the same goal as always—to help grow the industry with ever-improving insight, information and impressions. Upon closing the chapter on the fourth edition of a coffee-table magazine I’m extremely proud to have my name on, I would like to quickly reflect on the previously mentioned distribution list. 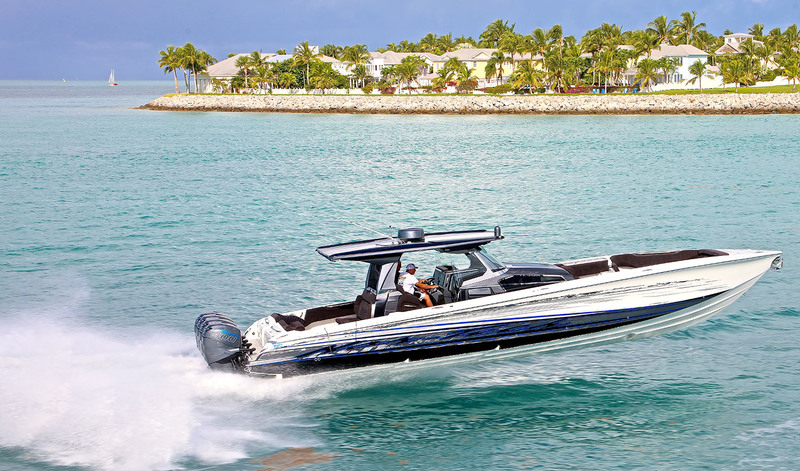 Compiling the substantial list of names of boating enthusiasts across the country—and the world—receiving a copy of the nearly two-pound, 196-page magazine, is something I don’t get to do everyday, nor would I want to; it’s a rather tedious task. Either way, it provides an opportunity to gain more insight about our audience/readership. Yes, we can get a lot of the same information from our analytics, but those are just numbers really, IP addresses, email addresses and such. When you see names, addresses and states in a distribution list, it’s different. It’s a little more personable, like a print magazine is supposed to be, right? For obvious reasons, the state with the most magazine orders was Florida. In second was another densely populated state—the one Trulio and I happen to reside in—California. And, maybe again not a surprise, there were two states battling for third with Missouri edging out Michigan in the end. Even with California and Florida receiving strong support from the states on each coast, the Midwest definitely triumphed in terms of regional orders as states like Iowa, Illinois, Ohio, Wisconsin and more also were well represented by orders. 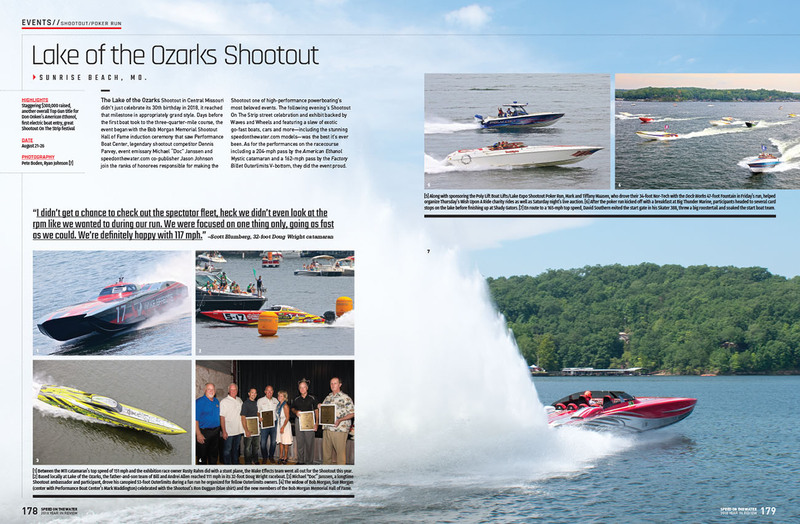 The Year In Review print magazine is full of image-heavy two-page spreads on events such as the Lake of the Ozarks Shootout. It’s cool to see magazines being shipped to places in all corners of the country from San Diego and Maple Valley, Wash., to Key West, Fla., and Mechanicsburg, Pa.
Now that sounds like a tough town, right? So I looked it up and learned that Mechanicsburg is a small town outside the capital of Pennsylvania, Harrisburg, and that its local waterway—the Susquehanna River and Clarke Lake—feeds into the northern part of the Chesapeake Bay. It’s also where the members of the glam-rock band Poison grew up. Look at that, you learn something new every day. I kind of already knew this, but I found out that boaters live in some very friendly sounding areas. For example, there’s Paradise Valley in Arizona, Lighthouse Point in Florida, Sunrise Beach in Missouri and Point Pleasant in New Jersey. I have to admit though that I was surprised to learn that there’s not just one city named Mechanicsville, but two—and they’re in adjoining states, Maryland and Virginia. Just 90 miles apart with dozens of rivers, lakes and bays in between to enjoy on a boat, the two cities don’t have much in common besides the name. The Virginia Mechanicsville is much larger with a population of close to 40,000 people while the Maryland town has less than 2,000 people. In doing all of 60 seconds of research, I did learn that singer Jason Mraz is from the Virginia city and that current Surgeon General of the United States, Jerome Adams, grew up on his family’s farm in the Maryland community. Yeah I know, too much information. Still, it was a fun exercise in seeing how far-reaching our boating community truly is. Before I go, I can’t write about these places and leave out what’s possibly my favorite city name on the delivery list—Kalamazoo, Mich., home of my friends at Bio-Kleen, who will be receiving their copies of the magazine in about a week or so. If somehow you forgot to order your copy—or maybe you didn’t even know the magazine exists—you still can order one here. You just won’t get it until after we receive our remaining office copies.